Observed feeding upon developing seeds of Velvet Ash (Fraxinus velutina) along French Creek, Bradshaw Mts., Yavapai Co., Arizona on 01 May 2009. Sometimes a photograph is sufficient to identify an insect to species. However, more often than not, more information is needed. Habitat information can be very useful - the specimen at left was found in a riparian canyon along the southern flanks of the Bradshaw Mountains, Yavapai Co., Arizona. 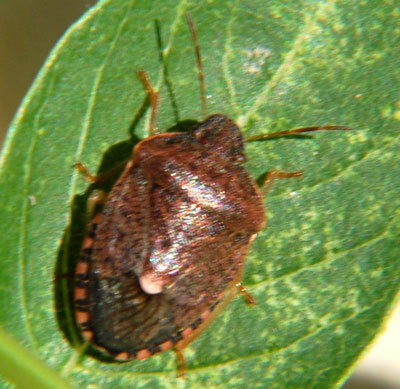 Also the size of the insect should be given if a scale ruler is not included in the photo - this brown stink bug is about 8 mm long. Host information can also be useful in narrowing down the identification of an insect or bug. Even still, most entomologists will be hesitant to give a diffinative answer without having access to the specimen and placing it under their microscope.